I’m currently working on the world maps for the game. I realized that I needed to sit down and start generating the content… all of it. Towns, people, quests, items sold, locations… everything! Another issue is I realized that too much focus on the engine can lead to games like Gates of Delirium and The Seventh Link. Both of these are excellent Ultima clones on the TRS-80 Color Computer line, but they have no soul at all. Although I’ll give the first one some credit, at least the towns have names… I really want each region to have character and each town to be a “place” in the mind of the player, not just “town #3” that sold “weapon #4”. The good news is that I’ve had the basic map and regions in my mind for quite some time… it’s really all about piecing it together. Because I’m not doing a big continuous world map, each world map is connected via very narrow edges or through other transitional maps. It’s very much like classic World of Warcraft prior to the Cataclysm expansion; map exits are cleverly disguised to transition you in a seemingly clean fashion. 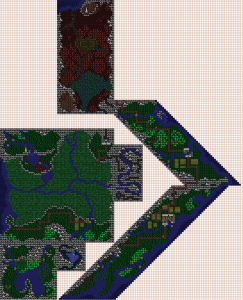 Each square is a block of 8×8 tiles, the total size of the map is slightly larger than the map of Ultima IV. However, it has significantly less wasted space, every map has at least 70% accessible area! So right now, I’m in the process of drawing all the world maps so I can piece them together into a more cohesive whole. I’ve had several of them drawn up on graph paper (I love drawing maps with colored pencils!) for several years, so it feels good to break them out and finally get them crafted in the game! 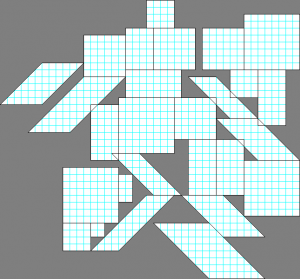 🙂 It’s actually taking longer than I expected to make each map; there’s a lot of tile plotting to do and I have to figure out exit points that align right on each map. In some cases it’s also leading to changes. I realized I needed another map when I realized that one I drew simply wasn’t large enough to contain all the content I wanted. I may also find that there isn’t enough tiles with varied looks to make each region a little different and unique; I may end up adding more as I progress. Here’s a sneak peak of the world map in progress… Enjoy! This entry was posted in CRPG, Design, RPG, Screenshots, TI-99/4a. Bookmark the permalink. Not much progress lately… my dad’s in the hospital and work is super busy.